Many miraculous stories took place in Norway during World War II. Over the next several months, I'll be sharing some of these stories, starting with those from the initial German invasion in 1940. 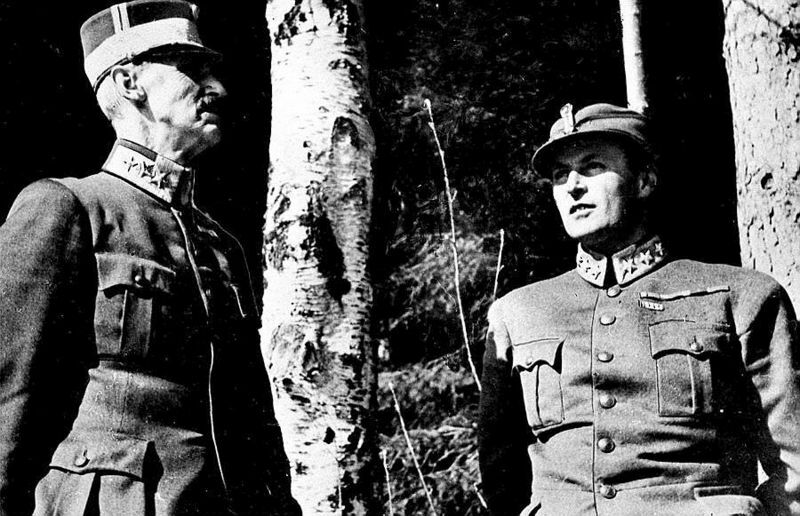 Norway didn't expect to be drawn into World War II. Just as in World War I, the Norwegian government had declared its neutrality and worked hard to maintain this status. But early on during WWII, two major factors made this position untenable. To maintain its war machine, Germany needed uninterrupted access to iron ore from Sweden. 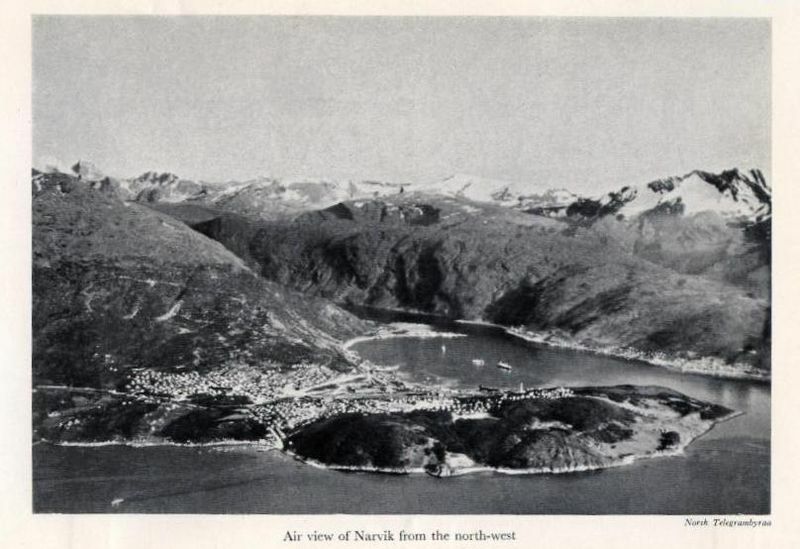 The only year-round ice-free port was at Narvik, Norway, to which the iron ore was shipped by train across a short distance. It was vital for German ships to travel safely down the Norwegian coast from this northern port, but England was determined to end German access. The Germans were concerned that the British would not only interfere with iron ore shipments but that the Allies would also gain access to Norwegian airfields and ports from which they could launch attacks on Germany. 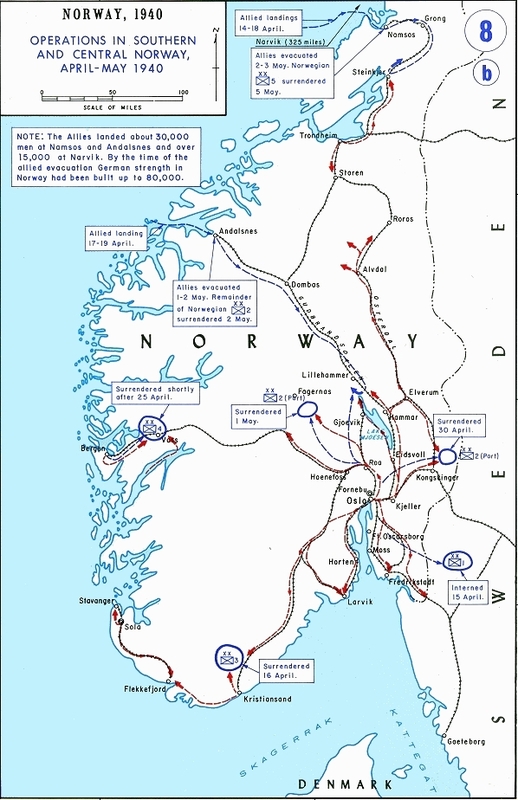 The Germans didn't believe the British would allow Norway to maintain its neutral status, so Hitler ordered his military to draw up plans to invade before the Allies could gain a foothold. In early April 1940, the British navy laid mines in the waters off the Norwegian coast at Narvik in an effort to force German ships into international waters where the Allies could attack. Unfortunately, the British waited too long. The German invasion was on. Today's post will focus on the firsthand accounts of Mrs. Florence Harriman who was U.S. Minister to Norway (now called Ambassador) before and during the early months of World War II. On the morning of April 8, the U.S. Legation (Embassy) in Copenhagen, Denmark, phoned Mrs. Harriman in Norway and reported that a large body of German ships was passing through the Great Belt. This is a strait north of Germany, between two large islands in Denmark. Most officials, including the Norwegian government, thought the fleet was heading to the North Sea to engage the British Royal Navy in battle. The British even withdrew all their ships from Norwegian waters. At 11:30 PM, the air raid alarm sounded in Oslo, but the street lights remained on for some time, and most assumed it was just another practice air raid alarm. Mrs. Harriman went to bed. 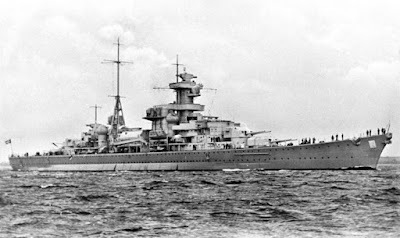 However, at 3:00 AM, she was awakened by a phone call and notified that German warships were coming up the Oslo Fjord (a long narrow waterway connecting the capital with the North Sea). Mrs. Harriman was unable to call or cable the United States - Nazi collaborators had already taken control of communications. Between 5:00 and 6:00 AM, Mrs. Harriman and others who had joined her at the American Legation made several trips to a newly-built bomb-proof room in the building. German bombers circled the city with Norwegian planes in pursuit. Anti-aircraft fire penetrated the early morning air. The Norwegian Foreign minister notified Mrs. Harriman that the Court and Government were fleeing Oslo on a special train, and they wanted her to join them. Although she began packing, she was only given a twenty-minute notice of the 7:00 AM departure time, so she left in her Ford automobile at 9:45 AM along with other Americans. On the route north to Hamar, those fleeing Oslo passed Kjeller Airfield, which the Germans had bombed, and the hangars were still burning. 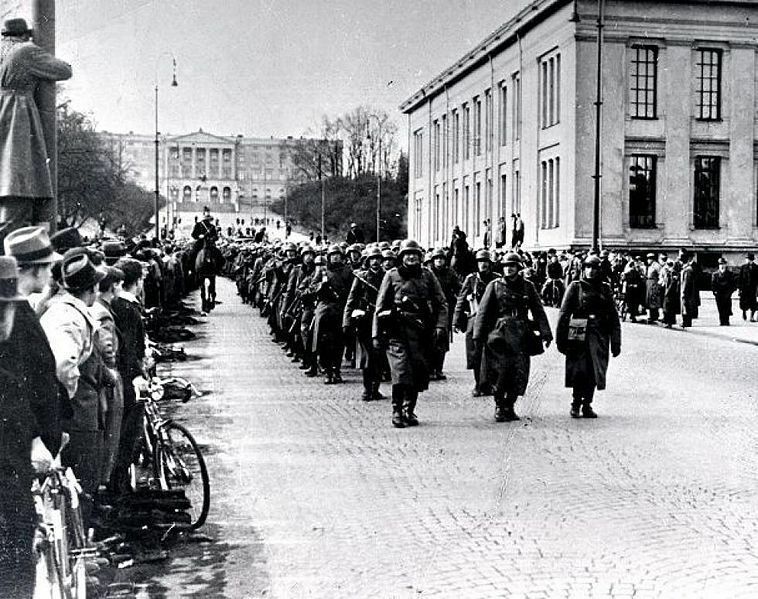 Behind them, the Nazis occupied Oslo, but their arrival was delayed by eight hours. 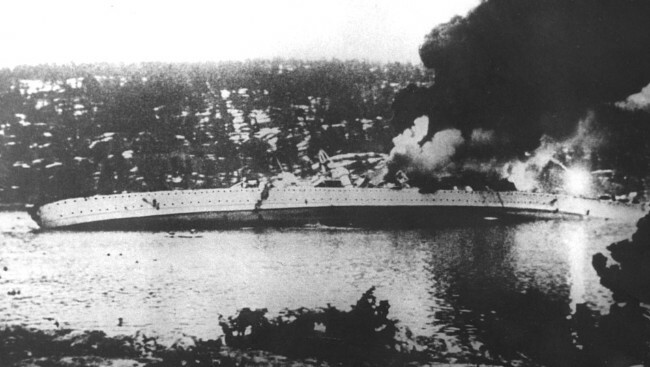 Coastal guns from the Oscarsborg Fortress sank the German flagship Blücher, which slowed down the invasion and allowed the King and Government to escape the Nazis. After six hours, Mrs. Harriman and her party reached the city of Hamar, but no accommodations were available under any roof. When word came that the Nazis were headed to Hamar, the Norwegian Government, and the U.S., British, and French Legations traveled in a long line of automobiles to Elverum. After the King and Royal Family passed by, soldiers erected a barrier south of town. Later two hundred Germans were killed at this roadblock, including the German air attache. Dept. of History United States Military Academy. Courtesy of Wikipedia. Upon reaching Elverum, the town was blacked out except for the brightly lit schoolhouse where the Norwegian Parliament, the Storting, was meeting. The King and Royal Family continued on to Trysil, seventy miles north, and Mrs. Harriman found lodging with a family outside Elverum. By 5:30 the following morning, German planes were attacking Elverum. The Germans flew at low altitudes and terrified the inhabitants with their deafening roar. When the bombing ended, only a church and Red Cross hospital remained. The Government escaped safely and retreated to Nybergsund. The Norwegian Foreign Minister urged Mrs. Harriman to follow, but a barrier stood in her way and deep snow made the forests impassible. The Norwegians maneuvered her Ford around a barricade, and only the frozen ice kept her vehicle out of the nearby river. Upon reaching Nybergsund, Mrs. Harriman found the town wiped out and no walls standing. She had no idea where to find the King and Government. She later learned that the King and Crown Prince had run for their lives into the forest when the Nazis attacked. Mrs. Harriman crossed the border into Sweden to make contact with the U.S. Legation in Stockholm and report that she and other U.S. officials were still alive. 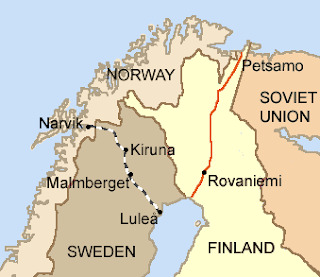 Although she remained close to the border and intended to cross back into Norway after learning the location of the Norwegian Government, she was never able to return. In her memoir, Mission to the North, she shared a portion of King Haakon's speech to his people, which he broadcast while on the run. "'In this hour, the most difficult our country has ever known in a hundred years, I send the most pressing appeal to each of you to do all in your power to save the liberty and independence of Norway. We have been the victims of a lightning attack from a nation with which we have always maintained friendly relations. That nation has not hesitated to bomb the civil population, who are suffering intensely....They have employed against us, and against the civil population high explosives and incendiary bombs and also machine-gunned us in the most savage fashion....I thank all those who are today with me and the Government, and who are fighting at their posts of duty for the independence and preservation of Norway. I pray you all to treasure the memory of those who have already given their lives for this country. God protect Norway.'" 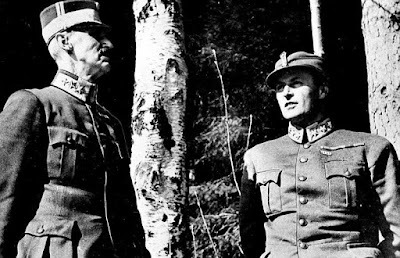 On the first of next month, I'll share more stories about the German invasion of Norway, including the final escape of the King and Royal Family. Mission to the North by Frances Jaffray Harriman. J. B. Lippincott Company. 1941. 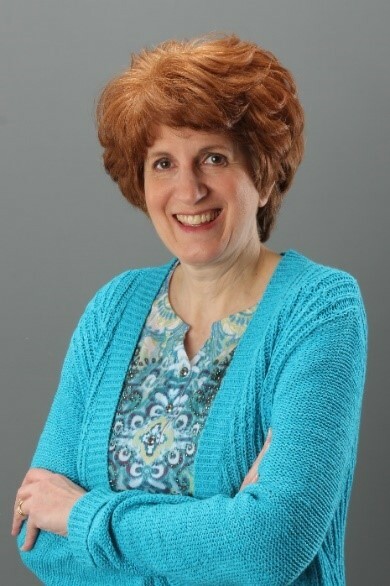 Cindy Stewart, a high school social studies teacher, church pianist, and inspirational historical fiction author, semi-finaled in the American Christian Fiction Writer’s 2017 Genesis contest, and won ACFW’s 2014 First Impressions contest in the historical category. Cindy is passionate about revealing God’s handiwork in history. She resides in North Georgia with her college sweetheart and husband of thirty-seven years and near her married daughter, son-in-law, and four adorable grandchildren. She’s currently writing a fiction series set in WWII Europe. 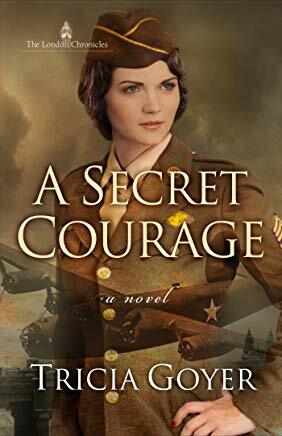 Earn a chance to win Tricia Goyer's WWII book, A Secret Courage, by commenting below. Also, earn another opportunity by sharing this post on Social Media. The contest will run until Saturday, 11/3, at 8:00 PM EST. Don't forget to leave your e-mail address and let me know if you've shared on Social Media. I wish I had known more of this history when traveling in Norway to locations you mention. Stacypilot at yahoo dot com. I'd love to visit these places myself. Thank you for commenting, Stacy. You're entered in the drawing. Thank you for this fascinating post! Shared on Google+ and Facebook. Thank you, Caryl. You've earned two chances to win the giveaway. Thank you, Melanie. I'm glad you enjoyed the post. You've earned a chance to win the WWII novel. I hope you include a post about a Norwegian commando raid that effectively crippled the Norsk Hydro plant critical to Hitler's quest for a nuclear bomb. The extremely difficult dead-of-winter 1943 attack was one of the most important acts of sabotage in WWII. Yes, I would like to share the story about the Norsk Hydro plant. I read the book, and I'm wondering how to shrink the tale into one blog post. Maybe it will be a continuing story too. Thank you for commenting and for your kind words below. You've earned a place in the giveaway. I should have also said, nice piece today! Hi, Kim. I'm so glad you saw the post and learned about some of the tragedy your family faced during WWII. There are several more posts to come about Norway. Thanks for commenting and you're entered in the drawing. Thank you, Connie. Glad you enjoyed the post. I knew a survivor of the invasion and member of The Resistance, who worked with British Forces after his escape. He was a long time professor at the University of Chicago, Ole Kleppa. I shared thru email and on Pinterest, Facebook & Instagram. Interesting, Jennifer! I'd love to read Professor Kleppa's story. Thank you for commenting and for sharing on social media. You've earned two places in the giveaway. Fabulous blog - I tried to find all the places mentioned on the map. Thanks so much for the giveaway. I shared on Facebook, Twitter, Pinterest and Google+. Hi, Betti. I'm glad you enjoyed the post and found the map helpful. I always like to see where the stories I read take place. It makes it seem more real. Thank you for sharing and for commenting. You're entered twice in the drawing. Awesome post, Cindy. I remember studying Norway in schuool but not this history. I've always wanted to visit there. I'd like to visit Norway too - especially now that I've been researching the history from WWII. Whole towns were destroyed and then rebuilt. And then there's the story about the gold that was smuggled out ... But that's a story for another time. You've earned a chance to win the WWII novel. Hi, Allison. Thank you so much for commenting and for sharing my post on social media. You've earned two entries in the giveaway. More stories to come on the 1st of each month! I'm sharing via e-mail, facebook and pinterest. Thank you for stopping by, Pat. I'm with you - I love to know the "why's" behind momentous events in history. You've earned to entries in the drawing! Thank you also for sharing my post. Love this neat post! Thanks for sharing. Hi, Maddy. Thank you for your kind comments. You're entered in the giveaway! And the winner of the Giveaway is Melanie Backus! Congratulations, Melanie! Thank you so very much, Cindy! I just realized I’ve never read anything based in a Scandinavian country! My curiosity is peaked!!! Hi, Jessie! I had the same thought, so I've started writing the second book in my WWII fiction series, and the beginning of this story is set in Norway.